Two years after the finding of George Mallory, in spring 2001, the research expedition returned to Mount Everest. This time the goal was to find Mallory's missing partner, Andrew Irvine, as he now provided the last realistic chance to discover one of the climbers' cameras - and with it perhaps the solution to the riddle of Mallory and Irvines last climb. The team remained almost unchanged over 1999: Besides leader Eric Simonson it included climbers Dave Hahn, Jake Norton, Brent Okita, Andy Politz, John Race, and Tap Richards; expedition doctor Lee Meyers, and myself as historian. Riley Morton accompanied the expedition as cameraman and on-site producer. Later the team was joined by mountainguides Jason Tanguay and Heidi Eichner. 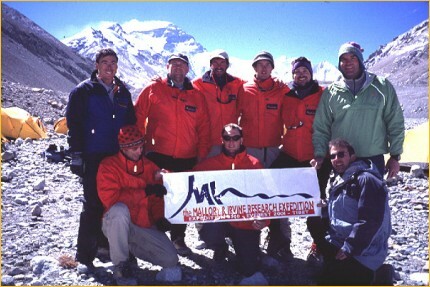 Twenty-five sherpas supported the expedition. Between April 24 and 27, Hahn, Politz and Richards undertook a first search effort. 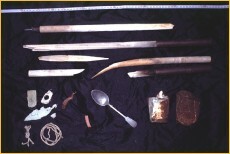 In its course, Richards found and conclusively identified the 1975 Chinese Camp VI, from where Wang Hongbao had found an "English dead". The climbers subsequently tried to put themselves in Wang's footsteps. They searched the camp's surroundings for three days, covering eight to nine times the area of the 1999 search. They found no trace of Andrew Irvine - George Mallory remained the only "English dead" in the vicinity of Wang's camp. Their attempt to find the 1924 Camp VI, Mallory and Irvine's last camp, on the North Ridge equally met with no success. In its remains we had hoped to find further clues to the climbers' fate. The exact position of the camp was unknown, altitudes varied between 26,700 and 27,000 ft. Besides the 1975 Chinese Camp VI, the first search also uncovered the remains of the 1960 Chinese Camp VI. The second search effort by Jake Norton and Brent Okita took place between April 28 and 30. In order to look for Mallory and Irvine's last camp, the two left the conventional route to Camp VI (which traverses out onto the North Face) and followed the true North Ridge instead. After four hours of searching, just before linking up with the area already investigated by the first team, they came across the camp's remains in a shallow gully beneath a rock tower at 26,700 ft.
Seventy-seven years of erosion had covered the camp - a single two-person tent - in a thick layer of gravel. Norton and Okita found tent poles, pieces of tent fabric and guy lines. Smaller items included a mitten, a sock with a clothing label "E.F. Norton" (expedition leader in 1924), two leather straps, solid fuel, a flashlight lens, and a tin of black tea. A second investigation on May 23 turned up more pieces of tent poles, two empty food tins, a spoon, and a piece of rubber hose (probably from an oxygen set). Any items of relevance to the Mallory and Irvine mystery, e.g. parts of the oxygen gear or notes, could not be found. A Mitten from Mallory and Irvine? On April 29 Norton and Okita continued their ascent to fix the route from camp VI to the First Step on the Northeast Ridge. At the exit onto the crest of the ridge, at 27,690 ft., Norton discovered an old woollen mitten. The mitten or overmitten is some 40 cm long, made of tightly woven wool fabric with almost felt-like texture. 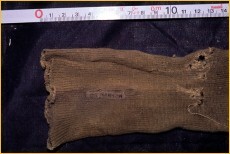 The material appears to predate the nylon and down overmittens used by the Chinese expeditions in the 1960s and 1970s. Only three parties - one in 1924 and two in 1933 - had reached the crest of the Northeast Ridge during the pre-WW II attempts, and the latter traversed below the spot where the mitten was found. The mitten must have belonged to the 1924 party - Mallory and Irvine. © Andy Politz/Mallory & Irvine Research Expedition 2001, from "Detectives on Everest"
Norton and Okita followed the Northeastridge to a point some 200 yards before the First Step, at 27,760 ft., where they came across the remnants of the 1960 Chinese Camp VII. A short descent over snow-covered slabs brought them to the area where Irvine's ice-axe had been found in 1933. "Gazing downward, I could see the basin in which we found Mallory. There is absolutely no way that the ice-axe could mark the site of a fall that led eventually to Mallory's (and presumably Irvine's) death� A fall to the basin would not only be unconditionally fatal, but would be completely body-shattering as well. Mallory's body position and condition clearly indicated that he had survived his accident - albeit for a short time. Regardless of this, there is another strong indication that the fall did not originate here: When I talk about 'limestone sidewalks' in the Yellow Band, I am not exaggerating. One would have to try quite hard to fall out of the Yellow Band at this point. [...] Climbers of Mallory and Irvine's calibre simply would not have fallen here, let alone have a fall that would get out of control." A short way below, a broad scree ledge runs across the face of the mountain, which - in Norton's opinion - would have stopped a slide almost instantly. Airphotos also show that a fall from the ice-axe location would lead some 40 meters to right of Mallory's resting place. Mallory's location rather indicates a fall from today's "climbers' gully" leading through the Yellow Band. While descending the Yellow Band, Norton and Okita examined the remnants of the 1933 Camp VI. A last search effort at the end of May originally had Hahn, Richards and Tanguay going for the summit and searching the upper Northeast Ridge for traces of Mallory and Irvine, while Politz was to conduct a last search for Irvine and the camera from Camp VI. The attempt was cut short when the climbers had to give up their summit bid less than 150 meters from the top to rescue five climbers, who had been forced to bivouack in the "death zone" without oxygen the previous night. In what was one of the most difficult rescue in Everest history, the team managed to save four of them - including two who had been stranded at the extreme altitude of 28,500 ft., above the steep and exposed Second Step.